Last summer, I took my lovely mum out for the day in Leeds for her birthday. We ended up in Lush. To be honest, I’d not been in the store for ages. Which, I see now, was a big mistake. We had a potter around and I came across a shower scrub called Rub, Rub, Rub. Like a large proportion of the population, I have those little red bumps on my upper arms (keratosis pilaris) and it’s been something I’ve been self conscious about for as long as I can remember. Something that my mum knows all too well. So, she was queueing up with a pot of this for me to try and some bath goodies for herself, when I mentioned to the staff that it was her birthday. Which resulted in a loud and enthusiastic rendition of “Happy Birthday to You” and a free pot of shower scrub each…hurrah! Rub, Rub, Rub turned out to be the BEST scrub I have ever used on my arms and so I’ve found myself buying replacements for that first, free pot on a regular basis. I do think that the staff in the Lush Leeds store are amazing. It might be the result of being surrounded by essential oils all day, but they are unfailingly kind, helpful and a pleasure to spend time with. No wonder people go back time and again. Like many girls, my daughter is fascinated with beauty products. We’ve even had that clichéd moment where she tried out all of my make-up in secret, emerging triumphantly from the bathroom looking rather clown-like and smelling horrifically of the half-bottle of perfume she’d doused herself with. I’ve wanted to indulge her a little bit, whilst at the same time holding her back from the worst elements; products that are clearly too grown up for her or full of nasty chemicals. I remember buying products from Cosmetics to Go when I was younger, and receiving the most exciting parcels through the post from them, and I knew that the new incarnation of that company would produce a similar amount of excitement for Eve. 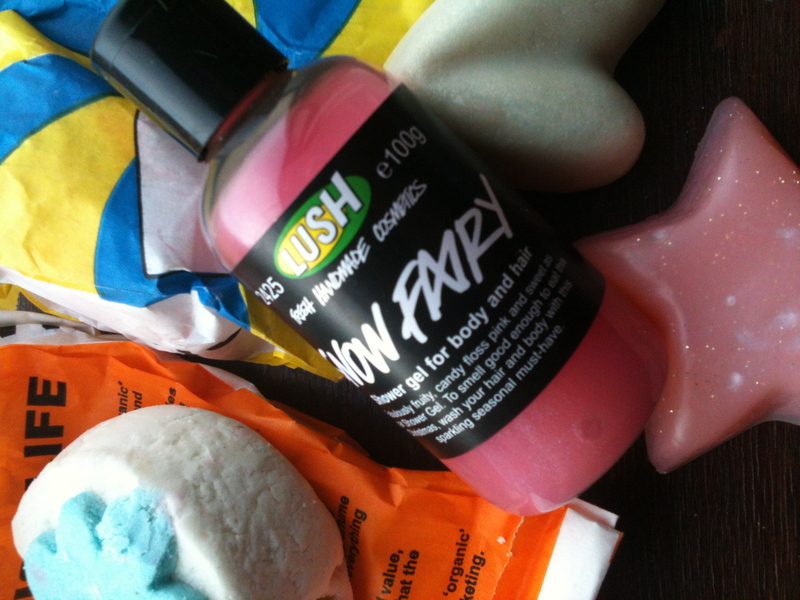 So I went back to Lush and came out of the store with a bag full of goodies including Creamy Candy and Pop in the Bath bubble bars and Snow Fairy shower gel. All of which have gone down a storm. As did the Ickle Baby Bot bath bomb I bought, which is filled with lavender and chamomile, so it even helps get both of the kids snoozy for bed! Our new favourite treat is to go to Lush together and choose a new bubble bar or bath bomb and it’s such a lovely thing to do and a great way of moving away from the idea that all treats have to come as chocolate. The truth is that there is no smell sweeter to me than the top of my children’s heads (which sounds odd if you’re not a parent, and completely understandable if you are) but the second sweetest smell in the world is probably the products from Lush. My next plan is to go back and find perfume and industrial quantities of wrinkle-filling face moisturiser. Which will be a story for another post. 7 Responses to We Love Lush. What’s not to love about Lush – my daughter has actually just asked this evening if she can take her pocket money out tomorrow and buy bath bombs! Lovely stuff! Oh I’ve just seen I’m on your blogroll! Thank you – what a privilege! You’re very welcome, I love your blog! I really love Lush. I also remember CTG. I think buying kids small treats from Lush is an excellent idea. Not only does it get away from the idea that all treats have to involve chocolate, it also is a good alternative to buying yet another plastic toy. PS good to see I’m on your blogroll too! I really must get round to doing one – you would definitely be on it!